I love when I stumble upon a book that celebrates diversity and encourages kids to be kids and not to look at or judge others based on the color of their skin. 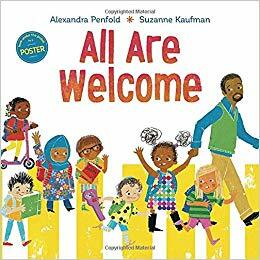 So, when I heard about a new children’s picture book, “All Are Welcome,” by Alexandra Penfold, I couldn’t wait to get my hands on a copy to share with my girls, and share my thoughts in a post on my blog. As you know I homeschool my two girls. But, we also go to classes outside the house, so they are around kids of all races, nationalities, etc. And, being part Latina, my girls are now at the age that they notice their skin color is different from mine, as I have pale white skin, and they are lucky to have beautiful tan skin thanks to their Daddy who is from El Salvador. The girls have asked why we look different, and I have talked with and even shared books about diversity with them, to help them truly understand how everyone on this planet is different in some, and that shouldn’t be a reason to mistreat or judge them. This book is really well written, and is recommended for children ages 4-8 years old. The pages are filled with vibrant colors that really help to bring the story of inclusion to life. Children will be introduced to people from all walks of life who may look different or dress different from them, as they read through the pages of “All Are Welcome.” They will see a school filled with kids wearing patkas, hijabs and even yarmulkes, who play side by side in the classroom and out at recess. I really love how this book is written and how they include so many races, religions and backgrounds, while repeating one key phrase, “All are welcome.” There is even a sign hanging outside the school that has this phrase, making it a welcoming school and story from the very start. “A warm, welcoming picture book that celebrates diversity and gives encouragement and support to all kids. Follow a group of children through a day in their school, where everyone is welcomed with open arms. A school where kids in patkas, hijabs, and yamulkes play side-by-side with friends in baseball caps. A school where students grow and learn from each other's traditions and the whole community gathers to celebrate the Lunar New Year. All Are Welcome lets young children know that no matter what, they have a place, they have a space, they are welcome in their school." My girls really enjoyed this book, and have even talked about it with their friends. They have even shown interest in learning about the cultural differences and traditions of those they saw in the book, so that they can learn and appreciate the diverse world we live in. I highly recommend this book for teachers looking for a book to share with their classrooms at the start of school, to remind children that even they their classmates may look different, that they shouldn’t be treated differently. Children may have questions and wonder why their fellow classmates may be wearing clothing or a headpiece. This book is great to share and open up the lines of discussion about diversity and need for inclusion of all. With all the craziness in the world right now, it is nice to look to our children and see them open their arms and hearts to those who may be different. They don’t see color or religion…they just see an opportunity for a new friendship. That is how it should be for all of all – welcoming everyone with open arms. We should live the theme of this book – “All Are Welcome.” Hopefully this book will be a reminder of this powerful message of inclusion, and have us thinking twice when we see someone who may be different than us, and be reminded that we should all be treated equal. To learn more about this wonderful new children’s book, which hit stores shelves back on July 10th, head on over to Random House Kids today. Alexandra Penfold is the author of Eat, Sleep, Poop (Knopf) and the picture books The Little Viking and Food Truck Fest! She is also a literary agent at Upstart Crow, where one of her clients is Suzanne Kaufman! Suzanne Kaufman is an author, illustrator and animator. Over the years she’s done everything from animating special effects for Universal Television and the Discovery Channel to animating award-winning video games for children. She’s the illustrator of a number of books for children, including Samanthasaurus Rex by B.B. Mandell, Naughty Claudine’s Christmas by Patrick Jennings, 100 Bugs! by Kate Narita, and her own book, Confiscated! among others. Learn more about Suzanne online at suzannekaufman.com.